A new cruise ship makes waves in Miami with a unique design - and a christening by a film legend. 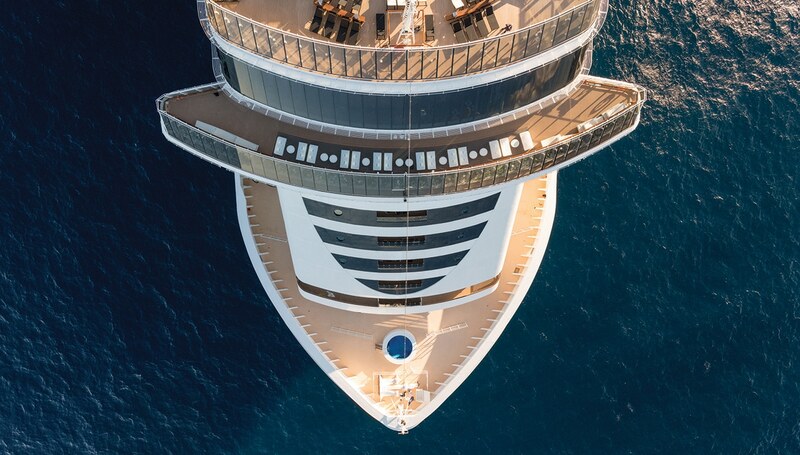 Step aboard the MSC Seaside. MSC is a family company. This is something you’ll learn within five minutes—give or take—of being introduced to the brand. You see, Gianluigi Aponte was just a young man in Naples, Italy, with a dream of building boats. Fastforward nearly a half century and the Aponte family is operating more than 480 vessels out of ports around the world. Of those vessels, the majority carry shipping containers, but 14 are passenger vessels. And of those 14 ships that operate under MSC Cruises, one was specifically conceived, designed and constructed for our city and the nearly 5 million passengers who travel to the Port of Miami every year to embark on a floating vacation. This MSC Seaside is beautiful (see the unique “beach condo” design), relaxing (hello, Balinese spa) and fun (a zip line and water slides galore). And it was christened this past December by the extremely famous godmother of MSC Cruises, Sophia Loren. I sat down with the legendary film star inside the Seaside’s MSC Yacht Club—a private ship within a ship with Royal Suites, exclusive dining, a 24-hour concierge and more than 17,000-square-foot sun deck—to discuss the joys of seeing the world from the water and her secret to timeless beauty. First, tell us about your relationship with MSC. How did you become the godmother of a cruise ship company? This is the 13th ship that I now have gone on. The owners are family friends, friends for life. We share many things together. You’ve travelled the world. What is your favorite destination? Naples. It’s the heart that takes me there, always. If we travel to Naples, where must we go for the best pizza Napolitana? Oh, by the sea! By the sea you will always find the best pizza and also some good fish. There are good restaurants by the sea. Is there a destination you’ve never been that you would like to go to? I’ve seen every theater in every city in the world, but it’s very seldom that I’ve been on many islands. Next, I would like to see the islands that I’ve never seen. It’s very beautiful to organize a voyage on a ship and to visit places where you’ve never been. Let’s talk about your timeless style. Who are your go to designers? Valentino and Armani. These are my favorites. Will you share your beauty secrets? If you are in the movies and you know your face, you always know what is the best for you. But I have always liked simplicity. Sophia Loren in the 1957 film Boy on a Dolphin. So the Sophia Loren beauty philosophy is to do... nothing? I don’t do massage. I don’t do exercise. I’m very lazy, but maybe I should do exercise. This is my idea, I’m going to start to do exercise. Any advice for young women looking to have a career in the movies? If you have something that you think you know how to give in front of a camera, do it. You might even end up with an Oscar, like me.